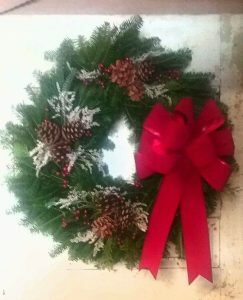 Our 22′ double sided Holiday wreaths capture the very essence of Maine’s beauty! Using a mixture of fresh cut balsam, pine, and cedar greens coupled with a handcrafted bow, clusters of pine cones, and red berries our wreaths are sure to delight your senses. Call us today to place your order. Shipping available upon request.